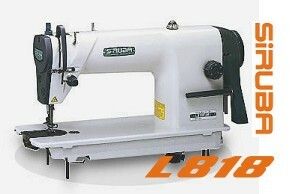 SIRUBA L818F Parts Standard Flatbed Lockstitch Machine. Built by SIRUBA in Taiwan to a very high quality standard. The design is loosely based round the Juki DDL5500/8500 series of lockstitch units. Need a Part for your SIRUBA L818 Machine? We can help you with most parts for this series of machine from SIRUBA. We actually Import them.